Parkland High School alumnus, David Vergara Salgado, had a couple of career ideas in mind while in high school so he decided he would gain more exposure in one area and see if he enjoyed it. “I knew that I either wanted to go into computers or cars,” Salgado said. “Then my uncle opened an automotive shop and I found I really liked working on cars. With cars more computerized now, it’s almost like I get the opportunity to work with both.” Salgado’s mom also encouraged him to be true to himself and be happy in whatever career field he chose. Salgado started taking classes at Forsyth Tech through the Career and College Promise (CCP) program while still in high school. Career and College Promise (CCP) provides qualified North Carolina high school students the opportunity to enroll in college courses, tuition free. CCP allows high school students a jump start on their college and workforce preparation. Salgado credited Sayla Nedell, Forsyth Tech career coach at Parkland High School, for encouraging him to pursue classes at the Transportation Technology Center. During this time, David Allgood, program coordinator for Automotive System Technology, observed Salgado and said he had a lot of potential and promise for the Toyota T-Ten program. 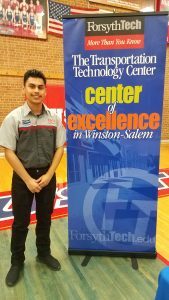 The summer after high school graduation, Salgado worked at Modern Chevrolet and entered the Toyota T-Ten Automotive Program at Forsyth Tech in the fall of 2018. Salgado had the opportunity to share his experience in Career and College Promise (CCP) during the Parkland High School Career and Trade Fair on February 26. He was a great spokesperson for Forsyth Tech and encouraged high school students interested in cars or motorcycles to look into the programs at the Transportation Technology Center. Salgado has earned certifications while working in an employer paid internship, allowing him to graduate debt free. Upon graduation from Forsyth Tech in 2020, Salgado will be certified in (ASE) Automotive Service Excellence, Snap-On and Lexus. He will be certified to work at any Toyota or Lexus dealership in North America. Recently Salgado has been offered a position with Modern Toyota while still in school so his career is picking up speed!